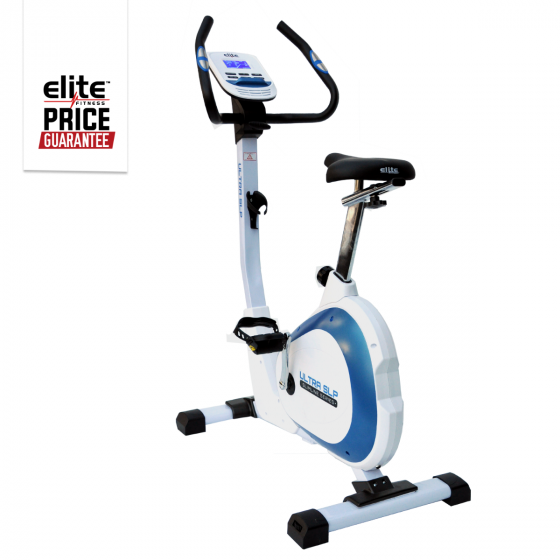 The Elite Ultra SLP Exercycle was the latest addition to the 2015 Summer season line up, with all the functions and features of a high-end market bike at half the price. Engineered with a stable 2mm thick steel tube, the heavy-duty framework accommodates a range of users who are serious about their fitness goals. The blue backlit LCD console offers workout statistics on Time, Speed, Distance, Calories, RPM and Heart Rate when using the Grip Pulse sensors. With 23 programmes to choose from (13 Built-In Workouts, 3 Heart Rate Programmes, 4 User Defined Programmes, 1 Body Fat Programme and 1 Fitness Test), this Class A equipment provides you with all the tools needed to achieve your fitness or weight loss goals fast! Programs: Stay motivated using the 23 built-in workout programs!